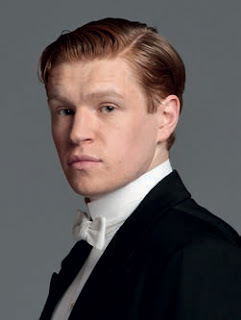 With the death of William Mason, Downton Abbey has been in need of a new footman for some time. He arrives at the beginning of series three in the form of Alfred, played by Matt Milne. “Alfred’s O’Brien’s nephew – that’s how he got the job,” says Milne, with a wry smile that suggests that being O’Brien’s nephew might be a mixed blessing. “His great aim is to be a cook, but he’s following his family’s wishes and doing what they want him to do. His mum wants him to be a butler so that’s where he’s headed.” It’s not an easy job, especially when you’re gawky, diffident and trying to come to terms with a below stairs culture that’s always fraught with manoeuvring. It means that Alfred is not only resented for having got the job via O’Brien, but for potentially not being up to the job at all. And he has other problems, too. Hereford-born Milne, 21, has had a busy year – it began with him being “plucked from nothing” in his words, to appear in Steven Spielberg’s First World War epic War Horse. “I was still studying drama at the University of East Anglia when that came up. Now this has come along I can’t believe it. It’s been an amazing twelve months or so.” But it does mean that he’s been spending a considerable amount of his early career living in the early 1900s.